Our Story Circle, led by Barbara Bates Smith, now affords participants the opportunity for “Fifteen Minutes of Fame,” a time when they can have the group’s undivided attention for up to 15 minutes, to tell us whatever they wish. With permission from some of the ‘famous ones,’ we’d like to share their stories here from time to time. 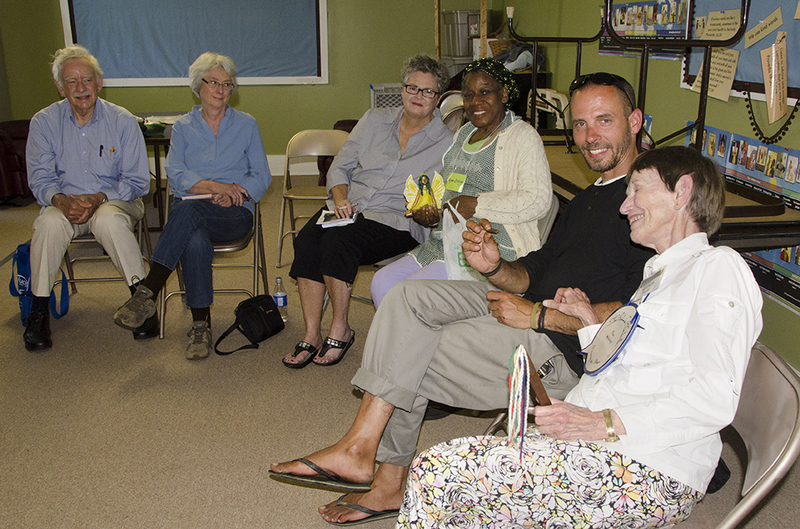 John, second from right in the photo, kept the group spellbound the day he held the spotlight! John was talking really fast in his 15 minutes of allotted Story Circle time, and we did our best to take notes. Another time he pulled out his guitar to play, but had no pick – until he spied a button on the sidewalk! Using that button for his pick, he was intrigued with the sound it made. He challenged his friend Jeffrey, with whom he often razzed about who was the best guitar player, to a “duel of the buttons,” drawing them from a button-filled jar. Indeed, supported by 7 years of plans and 40 notebooks of ideas, John has already envisioned “Asheville’s Next Signature Event!” to be an annual multi-layered showcase of Asheville’s best features: Arts, Fashion, Film, Cuisine, to name a few, in various locations on a fall weekend. A replacement for the now defunct “Belle Chere,” it will have a wider scope, promoting more of a “Romantic Asheville,” attractive to photographers as well as to tourists. John has been talking to business owners and city officials; the project is gaining favorable response. Just think – we may all get a chance to participate in John’s vision!